What is a good credit score to buy a home? So what is a good credit score to buy a home? When you are first going into the journey of home buying one of the major factors is your credit score. Why? you might ask because your credit score is the only way for the lender to determine whether or not you pay your bills on time. The definition of credit score is “a number assigned to a person that indicates to lenders their capacity to repay a loan“. Credit scores will vary throughout your lifetime as you go to college and start using those credit cards or if you get a car and start paying on your installment loan. In order for you to understand what score is good to buy a home you need to know what score is not good . There are standards of credit scores in terms of what a bank looks for scores range from 300 to 850, with 300 the absolute lowest and 850 the almost unattainable maximum. 1.) Charge-Offs – an example of this would be missing your payments for 6 months or more could cause your creditors to deem your account as uncollectible. 2.) Collections -a collection account is the term used to describe a person’s loan or debt which has been submitted to a collection agency through a creditor. Not only will creditors charge-off your account after a period of non-payment, they may also hire a third-party debt collector to attempt to collect payment from you. 3.) Bankruptcy – Bankruptcy will ruin your credit for some time to come. A Chapter 7 bankruptcy can remain on your credit report for up to 10 years. Your score can come down drastically from 130-240 points. 4.) Foreclosure – is the process by which a homeowner’s rights to a property are forfeited because of failure to pay the mortgage. The foreclosure’s actual point impact on an individual’s credit report is estimated to be from 125 to 175 points. A good credit score can also get you a lower interest rate when you borrow. That means you will pay less over time. For example, if you’re buying a $300,000 house with a 30 year fixed mortgage, and you have good credit, then you could end up paying more than $90,000 less for that house over the life of the loan than if you had bad credit. Building a good credit history makes it more likely you’ll be approved for loans you might need to help you achieve your financial goals. Plus, many lenders offer better terms and lower interest rates to people with good credit histories. 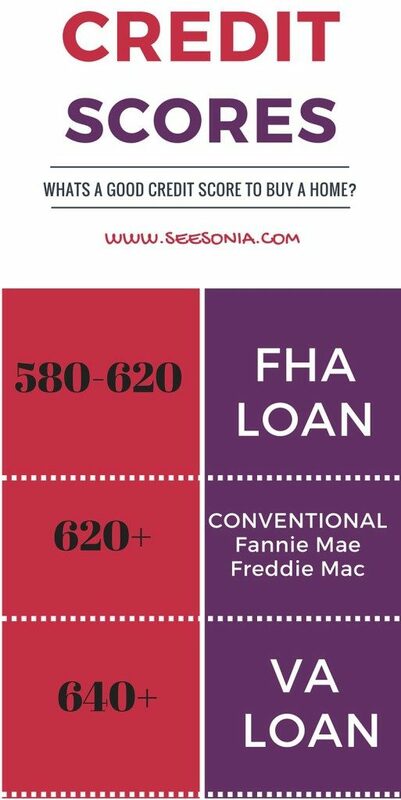 If you are shopping for a home here are the scores you would need to qualify please keep in mind guidelines change all the time.